You control who has access to view the Agency Dashboard within Security Group settings. Only Agency Users are able to have access to the Agency Dashboard. Our permissions settings allow you to control which data displays on the Agency Dashboard from six areas within AgencyBloc. By default, the security group of 'Administrator' is granted View Agency Dashboard Analytics permissions. Feel free to add view permissions to any of your additional security groups. From Settings, click on Security Groups. Note: The agency dashboard is only available for Agency User security groups. 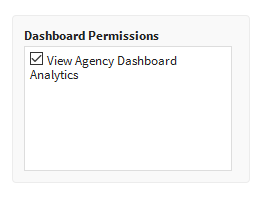 Under Dashboard Permissions (found in the bottom right corner), check or uncheck 'View Agency Dashboard Analytics. Users in a security group are only able to see Agency Dashboard sections based on where they are granted 'Visible' permissions. By default, the Activities section is included at all times on the Agency Dashboard. For example, if a security group only allows for 'Visible' permissions for Groups, Individuals, and Policies but does not allow for 'Visible' permissions for Carriers and Commissions, users in that security group will only see Activities, Groups, Individuals, and Policies on the Agency Dashboard.